The Erlanger Cancer Center teams the region’s only neurosurgeons with leading medical and radiation oncologists and neuropathologists – offering patients a full continuum of care for tumors of the brain and spine. This comprehensive approach means we’re equipped with advanced therapies to treat a broad spectrum of tumors. 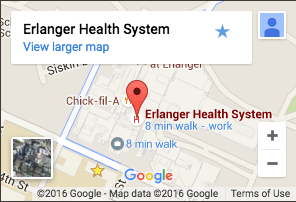 Erlanger Neurosurgery is at the center of Erlanger’s multi-disciplinary approach to treating tumors of the brain and spine. From the initial MRI for diagnosis to determining what treatment, if any, is needed – our neurosurgery team helps patients succeed along a very stressful journey. Because many small or benign tumors don’t require treatment, we take a conservative approach, avoiding surgery whenever possible. However, when surgery is needed, Erlanger Neurosurgery offers tremendous specialization in both biopsy and tumor removal, supported by the latest technology to ensure precision. For example, Erlanger’s StealthStation surgical navigation system empowers our neurosurgeons to make data-driven decisions in the operating room by integrating the most advanced surgical planning software, instrument tracking technologies, and 3-D intra-operative imaging. This GPS-like system helps our surgeons precisely track their surgical instruments in relation to patient anatomy - minimizing pain and limiting surgery to smallest possible area. Erlanger Radiation Oncology offers the latest advances in the treatment of brain and spinal tumors using focused radiation. For selected patients with small brain tumors, we offer non-invasive treatment using the Cyberknife. Patients lie comfortably on a treatment table while the Cyberknife robot delivers multiple beams of high dose radiation to the tumor, protecting other critical parts of the brain from unnecessary radiation. Treatments are painless and precise. Tumors can typically be targeted in one to five treatments. For larger, more aggressive brain tumors such as astrocytomas or GBMs (glioblastoma multiforme), external beam radiation therapy is delivered on our linear accelerator. In addition, we now offer tumor-treating fields (TTF) using the Optune device from Novocure. Optune is approved by the FDA for treatment of GBMs and represents the latest technology in the treatment of these deadly tumors. Another major component of our full-continuum neuro-oncology care is Erlanger Medical Oncology – a team of specialists who treat cancer using the latest advances in chemotherapy and other medications. Through our membership in the East Central Oncology Group, our medical oncologists offer patients a wide range of clinical trials – research studies exploring new treatments. For example, our medical oncologists are actively researching Immune Checkpoint Inhibitors, a new form of immunotherapy that activates the body’s own immune system to fight many types of cancer, including some brain tumors and glioblastoma multiforme (GBM).